The Whig Party was formed during the 1830s by the union of diverse factions that opposed the policies of President Andrew Jackson and the Democratic Party. Many supported Henry Clay, a proponent of internal improvements, protective tariffs, and a national bank. Advocates of state rights challenged Jackson's threat to use force to make South Carolina accept an unpopular import tariff in 1832. Jackson, a strong, assertive president, heavily wielded his power, frequently not only vetoing bills but also pushing his own agenda in Congress. His opponents called him "King Andrew" and began to call themselves "Whigs," taking the name of the opposition party in Britain. Whigs favored an active role for government, particularly in promoting internal improvement projects to aid transportation and public institutions such as schools, mental hospitals, and penitentiaries. The Whigs also endorsed a strong national bank to boost investment and tariffs to protect American industries. The new Whig Party found many supporters in North Carolina, especially in the west and the Albemarle Sound region. Most of the east, which was dominated by wealthy planters, remained firmly Democratic. In the election of 1836, Whig candidate Edward B. Dudley won the governor's race, and Whigs received a large minority in the General Assembly and a slight majority of the state's congressional seats. 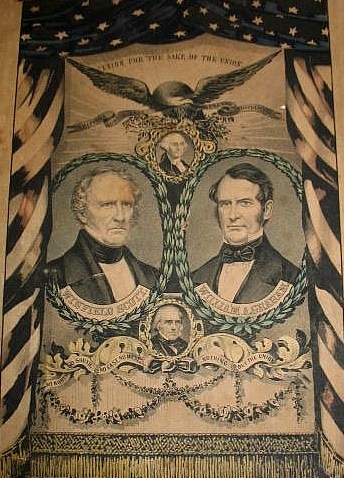 The elections of 1840 further increased the power of the Whig Party: voters elected its candidate, John Motley Morehead, to the governorship, and the legislature chose Whigs Willie P. Mangum and William A. Graham to represent North Carolina in the U.S. Senate. The Whigs thus controlled state politics from 1836 to about 1850. In 1854 future governor Zebulon B. Vance won his first election, as the Whig candidate for a seat in the North Carolina House of Commons. Among its major accomplishments in North Carolina, the Whig Party counted the expansion of railroads, creation of the state public school system (1839), and establishment of the first state school for the deaf and the blind and of the first state mental asylum, then called Dix Hill (later Dorothea Dix Hospital). The Whig years also saw an increase in the number of newspapers and publishers and of private academies and colleges, as well as a decline in illiteracy. The Whigs actually began losing their hold on North Carolina in the late 1840s. Many of their national policies-fostering strong banks and protective tariffs, promoting industrial development-were of little interest to the citizens of an agrarian state such as North Carolina. Although southern Whigs did not oppose slavery, the Democrats were much more emphatic in actively supporting slavery and resisting abolition. The Whig Party disintegrated during the 1850s. In the North, its remnants formed much of the foundation of the new Republican Party. The decade and a half of Whig control had permanently changed North Carolina, turning the so-called Rip Van Winkle State into a leading power in the South. As the Whig Party disappeared, its progressive policies were adapted and put into practice by many leaders of the revitalized Democratic Party of the 1850s. For the election campaign of 1860, the Whig Party was briefly revived in North Carolina as a Unionist alternative to secessionist Democrats and northern Republicans. During the Civil War, North Carolina Whigs evolved into the Conservative Party, which often opposed Jefferson Davis's administration and endorsed stronger individual and state rights. Michael F. Holt, The Rise and Fall of the American Whig Party (1999). Herbert Dale Pegg, The Whig Party in North Carolina (1968). Hamilton, Joseph Gregoire de Roulhac. Party Politics in North Carolina, 1835-1860. Durham, N.C.: Seeman Printery, 1916. Photograph of Campaign Ribbon; Accession #: H.1914.54.4, 1840, from the North Carolina Museum of History. Photograph of Broadside; Accession #: H.1914.54.4, 1840, from the North Carolina Museum of History.